The Ergo Comfort Rug™ is a brand new product from the makers of GelPro™. Combining three products into one, the Ergo Comfort Rug starts with an incredibly soft designer accent rug that sits on top of a therapeutic comfort mat with a built-in non-slip rug pad. The ¾” high-density comfort mat will not bottom out like memory foam mats and prevents pain and fatigue caused by standing. 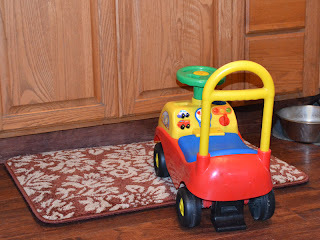 Rug covers can be purchased at gelpro.com to change décor. The Ergo Comfort Rug™ is easy to care for, just vacuum, spot clean or machine wash as needed. 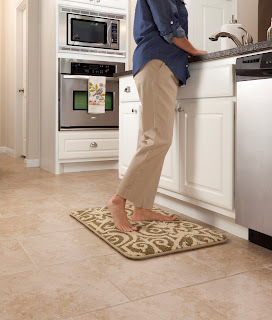 These rugs add warmth and comfort to any kitchen, bath or laundry room. Rugs are 22” x 34” and retail at $69.95. Our rugs, along with all our mats are proudly Made in the USA! Stand in Comfort! GelPro: The Original Gel-Filled Comfort Floor Mats Constructed with a 100% revolutionary gel core, GelPro floor mats are ergonomically designed to provide supreme comfort to your feet, legs and lower back while standing for extended periods of time on hard flooring. Experience the difference a GelPro mat makes in your home today. People spend a lot of time in their home standing on hard surfaces that were not designed with comfort in mind. Standing for an extended period of time - while cooking, doing loads of laundry and other activities - causes stress to your whole body, especially in your feet, joints and lower back. While standing, your leg muscles are in a constant state of flexion, which reduces blood and oxygen flow throughout your body causing fatigue. According to the Center for Disease Control and Prevention, around 46 million Americans suffer from arthritis and Newsweek magazine has reported that 65 million Americans experience back pain. GelPro comfort floor mats are ergonomically designed to address these painful problems. Each mat has a revolutionary shock-absorbing gel core that cradles your feet providing extra support and cushion. This unique, patented technology provides therapeutic pain relief, which allows you to do the things you love in ultimate comfort. Experience the unsurpassed quality, style and comfort of a GelPro mat in your home. 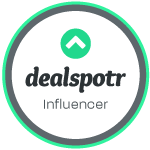 Use Coupon Code MOM13 to save 10% on orders over $99, 15% on orders over $199, 20% on orders over $299, or 25% on orders over $399! Limited time offer, excludes medical and commercial mats. Click GelPro ErgoComfort Rug Giveaway to enter for a chance to win a FREE ErgoComfort Rug from GelPro! 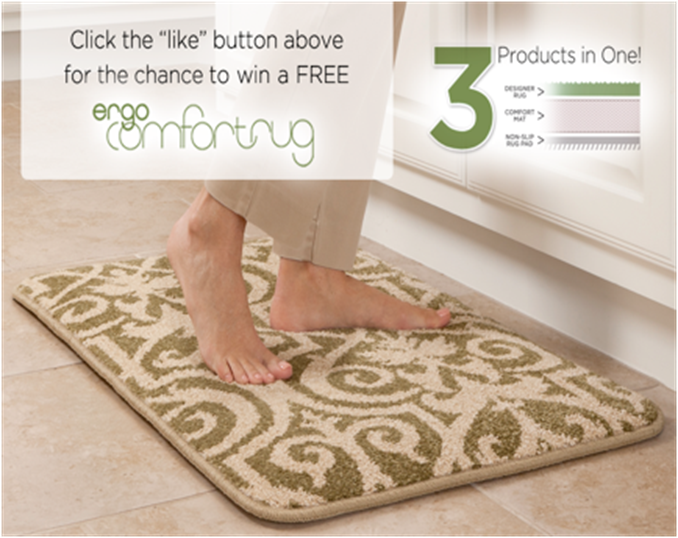 One ErgoComfort Rug to be awarded every week from now thru May 3rd, 2013! I received a ErgoComfort Rug from GelPro in the Farnsworth Rawhide design. I gotta say, I LOVE this rug. It’s thick, comfy and definitely luxurious on my feet! With a ¾” thick high-density comfort mat covered by a **get this** REMOVABLE, MACHINE-WASHABLE cover! The cover has a non-slip bottom, and a gorgeous design, Artisan Series soft cushy top. Being short, I especially appreciate the extra height standing at the countertop. I spend the majority of my time at home either sock-clad or barefoot, and with hard floors in my dining room and kitchen, where I also spend a lot of time! my feet can be sore by the end of the day. The hardest decision was where to put the rug . . . at the stove where I spend time cooking all our meals from scratch, or at the sink for washing dishes at night. Ultimately, it went in front of the sink as I figured it’d be the best treat for my feet at the end of the day. I am SO glad it is machine washable, because I’ll be using this rug for years!! Now, the funny thing is, I’m not sure how much I’ll get to use this wonderful, comfy rug! I’ll be fighting the kid for it! As soon as it first hit the floor, he made a beeline for it so he could play sitting on it. Then this morning, decided it was the perfect place for truck parking. Well, he is cute after all, so I suppose I could share it with him! Apparently this is where trucks are parked!